Two of the best mountaineering books ever written were designed to be read side by side, but I wonder if anyone ever has. I set myself the challenge of reading alternate chapters of The Ascent of Nanda Devi by H.W. Tilman and The Ascent of Rum Doodle by W.E. Bowman, first a chapter of one, then a chapter of the other, and so on, until I’d finished both books. Has anyone ever done it before? Probably not. I have no idea, but I knew it would be fun to give it a try. The Ascent of Rum Doodle and The Ascent of Nanda Devi: has anyone every read these two books at the same time? Written in 1937, The Ascent of Nanda Devi is the true story of the first ascent of 7816m Nanda Devi in the Indian Himalaya, the highest mountain ever climbed (until Herzog and Lachenal climbed Annapurna in 1950). Written in 1956, The Ascent of Rum Doodle is the fictional account of the first ascent of 40,000½ feet (12,192m) Rum Doodle in Yogistan, the highest mountain in the world. Many people (including me) regard it as the funniest book about mountaineering ever written, but many of Tilman’s books run it a close second, even though they are supposed to be serious travelogues. The style of writing is very similar. Tilman writes with a dry, matter-of-fact, sense of humour. Unless you are in tune with it, you may not even realise he is trying to be funny. In contrast Binder, the main character and narrator of The Ascent of Rum Doodle recounts ludicrous incidents in a deadpan way. He is not trying to be funny, but every sentence he writes is hilarious. 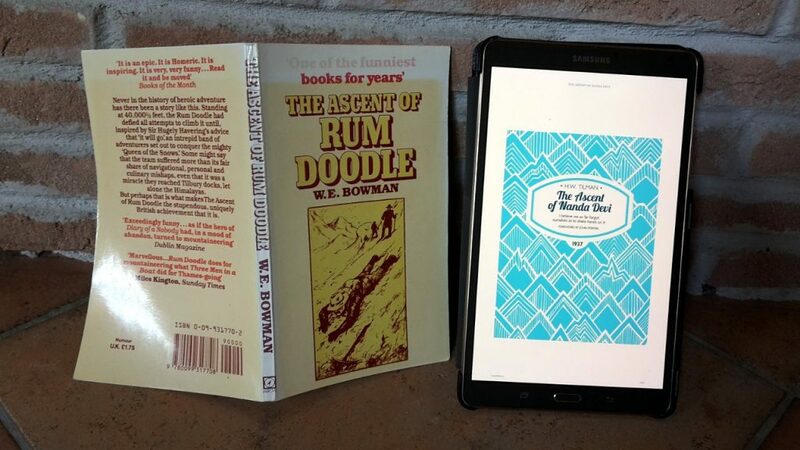 Some people believe The Ascent of Rum Doodle is a parody of The Ascent of Nanda Devi. Both books describe an expedition to a very high mountain somewhere among the high peaks of Asia. But how many other similarities are there? Was Bowman parodying this book in particular, or a whole genre? I’ve read The Ascent of Rum Doodle about 153 times, but I’d only read The Ascent of Nanda Devi once, so I decided to re-read both books at the same time to find out. It didn’t take me long to realise that The Ascent of Rum Doodle couldn’t possibly be a straight parody of The Ascent of Nanda Devi. If it were, then it would be a much longer book. In common with all Tilman’s travel writing, The Ascent of Nanda Devi is as much about the journey as the goal. He held the record for standing atop the highest mountain that had ever been climbed for 14 years, but he was the least likely person to hold such an accolade for so long. He wasn’t interested in records, and throughout his life he enjoyed adventure for its own sake. Most of his travels involved some sort of loosely defined goal, but very few of them ever ended in success like this one. Rarely did that seem to bother him. Nanda Devi is a famously inaccessible peak surrounded by a ring of other high mountains. There is only one way to reach its base in the Nanda Devi Sanctuary, by ascending the narrow, precipitous Rishi Ganga Gorge. Tilman discovered this route with fellow explorer Eric Shipton three years earlier. He had only accompanied Shipton on that expedition by chance after he sent Shipton a letter inviting him for a two-week holiday in the English Lake District. Shipton needed a partner for his expedition, so he wrote back inviting Tilman for a seven-month expedition in the Himalayas. Tilman’s second Nanda Devi expedition came about in an equally serendipitous way. A group of young American climbers with no Himalayan experience invited him to join them on an expedition to climb Kangchenjunga, the third-highest mountain in the world. Tilman suggested they climb Nanda Devi instead. Although it was originally the Americans’ expedition, because of his previous experience, Tilman ended up doing most of the organising. 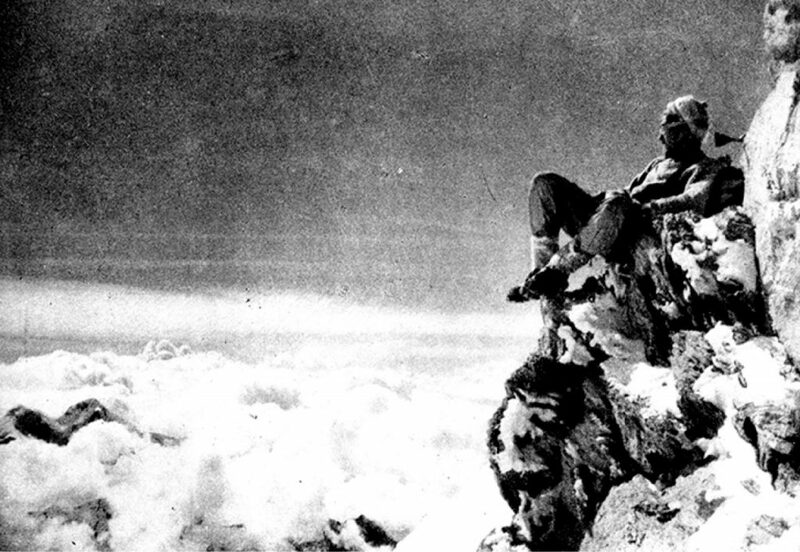 He even ended up as one of the summit pair by chance, when Charles Houston became ill the night before their ascent. The first half of The Ascent of Nanda Devi covers events long before they start climbing. Tilman heads out to Darjeeling to recruit Sherpas, then to Garhwal to organise supplies and arrange porters to carry their equipment into the Sanctuary. He is joined in this early period by one of the Americans W.F. Loomis, but Loomis has difficulty finding him. Tilman receives a comical sequence of telegrams detailing Loomis’s movements, but is never sure if he will arrive. This is reminiscent of Jungle, the incompetent navigator in The Ascent of Rum Doodle, who is always getting lost, and fails to arrive at their meeting in London before the expedition, despite sending a series of cables to say that he is on his way. Tilman’s trek up the Rishi Ganga Gorge is covered in detail. There are hairy sections of climbing and scrambling, difficult river crossings, and endless negotiations with their porters to encourage them to go on. The actual ascent covers less than a third of the book, and it’s surprisingly straightforward. Although most of the team, including all of the Sherpas, become ill and lose the strength to climb, Tilman and Noel Odell remain healthy and almost seem surprised to step onto the broad summit plateau. The laconic Tilman is not one for big celebrations, and here he produces one of his most famous lines. I believe we so far forgot ourselves as to shake hands on it. The Ascent of Nanda Devi also has an exploratory postscript. After returning from the summit, Tilman leaves the Sanctuary by an alternative unexplored route with Houston and Pasang Kikuli, their most reliable Sherpa. More comic adventures ensue as the three men become separated, and compete to find the best route back to civilisation. The Ascent of Rum Doodle begins with a team meeting in London, a boat journey and a train journey which have no real parallels in The Ascent of Nanda Devi, although they do in other mountaineering books Bowman may have read. 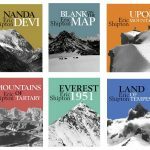 These include Eric Shipton’s Nanda Devi, about his and Tilman’s first visit to the peak, which features an entertaining episode on a train platform in India, as they frantically try to locate their Sherpas and board the same train together. The trek in to the base of the mountain is rather shorter in The Ascent of Rum Doodle, only six pages, in fact, but it’s full of incident. Binder marvels at the flora, which includes Nostalgia, Melancholia and old-fashioned Manspride. Shute the photographer is on the lookout for fauna and is lucky enough to see the scapegoat, platitude and hairy disgrace. There is also an encounter with the Atrocious Snowman, which doesn’t make an appearance in the The Ascent of Nanda Devi, though there is no shortage of yeti stories in Tilman and Shipton’s other books. The equipment for this camp had to be carried from the railhead at Chaikhosi, a distance of five hundred miles. Five porters would be needed for this. Two porters would be needed to carry food for these five, and another would carry the food for these two. His food would be carried by a boy. The boy would carry his own food. Porters play a memorable role in both stories. Tilman’s team experience a porter strike, when the majority of the porters refuse a river crossing and demand to be paid off. The stout-hearted “Mana men” (from a village on the way in) remain, and continue all the way into the Sanctuary. The porters in The Ascent of Rum Doodle are a little more heroic than this. Descriptions of them slinging the “sahibs” onto their backs and carrying them up the mountain are reminiscent of some modern-day Everest reporting. Unlike Tilman and Odell’s exploits on Nanda Devi, the climbing on Rum Doodle is far from straightforward. On their first foray onto the glacier, the route-finder Jungle ends up going round in circles. The rest of the team follow his footprints, but it’s only after they pass the photographer Shute waiting by the side of the trail several times that they realise their mistake. Jungle falls down a crevasse, and the rest of the team have to be lowered one-by-one to rescue him. Only when the entire team but Binder are stuck down the crevasse, are the porters called upon to climb down and bring them back up again. Binder is plagued by the cook Pong, who stews food with old socks and seasons it with grated boot leather. The priority for most of the team is not to climb the mountain, but to avoid Pong. But Binder remains resolute, and like Tilman he is the one to reach the summit. There is only one problem. His barometer reads 35,000 feet, and Rum Doodle, as everyone knows, is 40,000½ feet high. Then I saw. Over to the east a magnificent mountain stood against the sky, its glittering summit 5,000 feet above me. We had climbed the wrong mountain. Binder had climbed Rum Doodle’s sister peak, North Doodle, but it wasn’t a disaster. 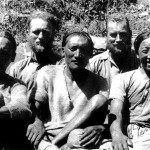 The team doctor, Prone, who spent the entire expedition ill, had been carried to the top of Rum Doodle by his porters after a mistranslated instruction. So Rum Doodle had been climbed, and the expedition was successful. Climbing the wrong mountain and looking across to the right mountain happens in one of Tilman’s other books, Snow on the Equator, when he and Shipton had a few navigational difficulties in the thick mist of the Rwenzori Mountains of Uganda. But unlike Binder and his team, Tilman didn’t make the mistake of climbing Nanda Devi’s second peak, East Nanda Devi. So it’s fair to say The Ascent of Rum Doodle’s dramatic finale was not inspired by The Ascent of Nanda Devi. Nor are the two main protagonists in any way similar. Binder spends much of the expedition quizzing his teammates about their relationships, behaviour that would make the whiskers on Tilman’s moustache bristle with irritation. None of Tilman’s teammates ever suffered a failed relationship because of a misunderstanding with a performing seal. Binder isn’t highly respected by his teammates. Most of them spend the expedition making fun of him, until the team strong man Burley sticks up for him at the end. He is, on the other hand, held in high regard by the porters, who frequently belch in his presence, a mark of respect in Yogistani. In contrast Tilman is highly respected by his teammates. He is the one who does most of the organising, and when they decide they need a leader, he is elected to the position by consensus. 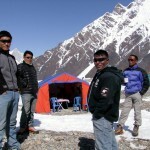 But if The Ascent of Rum Doodle wasn’t a direct parody, there are many other incidents from The Ascent of Nanda Devi which found their way in. Wish, the expedition’s scientist, takes with him “a mechanical glacier shovel and a three-ton pneumatic geologist’s hammer”. Burley, who has certain things in common with Tilman, tells him that scientific equipment has no place on an expedition whose purpose is to place two men on the summit. In The Ascent of Nanda Devi, Tilman is quite preoccupied with the glacier drill that the team geologist Odell has brought along to take ice samples. The seven [tent] poles made up half the load and the other half was something just as unwieldy but rather less necessary, a glacier drill. In an early part of his book, Tilman describes the geography of the mountains surrounding Nanda Devi. This mountain is the highest of the encircling peaks and from it extends that short ridge, the middle stroke of the reversed letter ‘E’, which links it with Nanda Devi itself. The Rum Doodle massif is in the shape of a reversed letter M. The summit comprises two peaks: Rum Doodle itself and North Doodle … The last stroke of the reversed M is completed by the southern ridge of the Rankling valley. And then there is the word ‘go’, as in, would the mountain ‘go’. “The mountain is difficult – severe, even – but will it go?” (Rum Doodle). My copy of The Ascent of Nanda Devi even has a helpful footnote at the end of Chapter 2. “We concluded unhopefully that a lodgement could be effected on the south ridge, but it seemed unlikely that the ridge would ‘go’,” said Tilman. ‘Go’ – a useful climbing idiom meaning not that the ridge went anywhere but that a climber could go up the ridge. I’m glad they cleared that one up. At this point I should mention that I re-read The Ascent of Nanda Devi at the suggestion of Vertebrate Publishing, who sent me a digital copy. 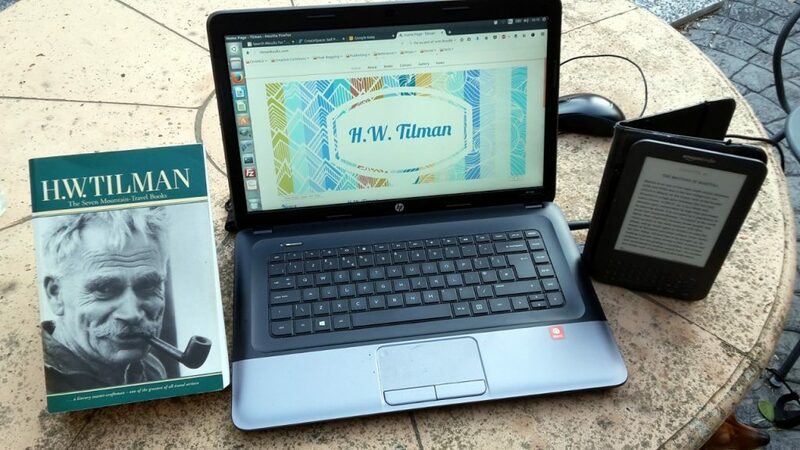 They are in the process of reissuing all of Tilman’s books as single editions. 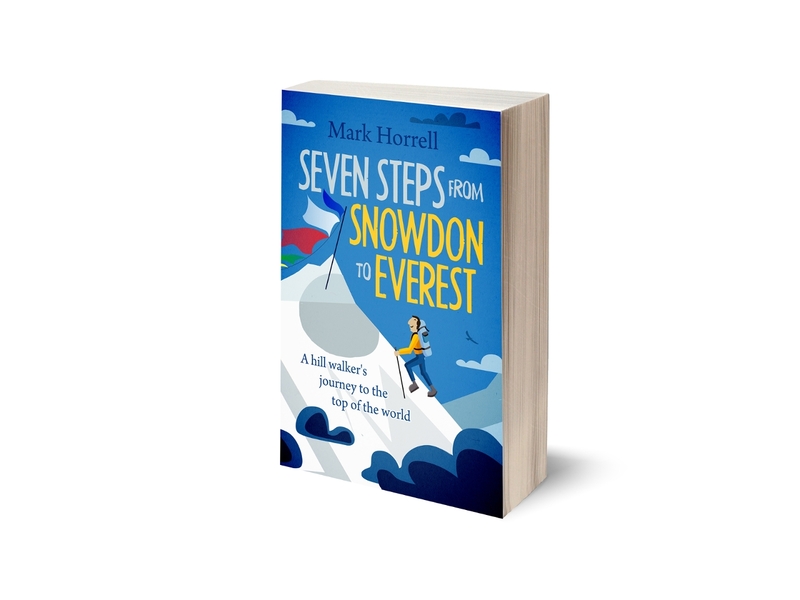 For a while the books have only been available as two giant doorstops, one containing all seven of his mountaineering books, and the other containing all eight of his sailing books. These were enjoyable, but they weren’t very portable, and they weighed almost as much as a glacier drill. The new versions are much more manageable. The omnibus editions also lacked a few of the original photographs, which have been restored in the new editions. They’ve even given The Ascent of Nanda Devi a new subtitle: I believe we so far forgot ourselves as to shake hands on it (haha). I’m sure I’ll be re-reading a few more. Anyway, to conclude this blog post, if you’ve not read The Ascent of Rum Doodle and The Ascent of Nanda Devi side by side, I can recommend it. You won’t care whether one’s a parody of the other, but you’re certain to roar with laughter. 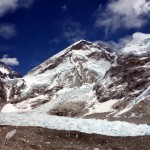 I enjoy your blog immensely and it is gratifying to follow your exploits from Snowden to Everest. I followed your literary advice and have read several of the Shipton reissues including Nanda Devi and also Rum Doidle both I n proximity. I don’t see a srelationship between the books. I think for an American reader Rum Doodle’s language can miss the mark and that Shipton is more inherently humorous. Best. You write stuff that makes the reader want to read more Mark.